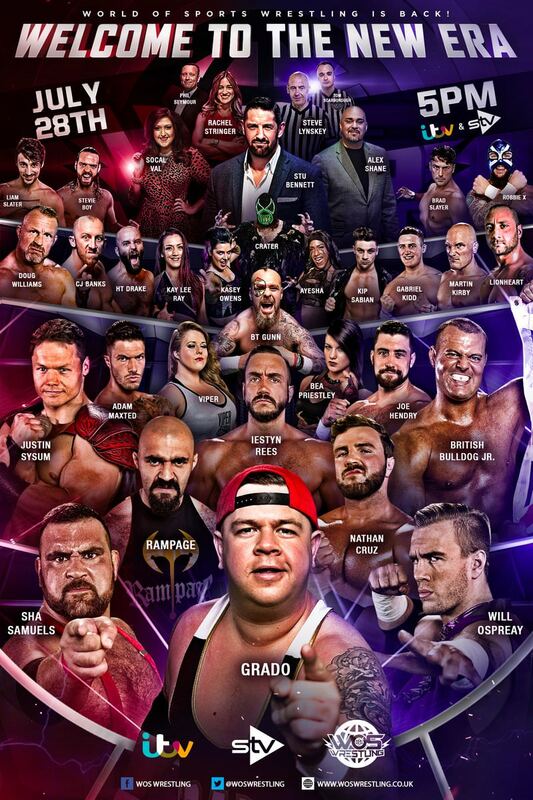 Pro wrestling returns to terrestrial TV in the UK. 10 one hour episodes, starting July 28th at 5 PM. I'm really interested in checking this out. They've put together a solid roster. If this thing takes off it could be really big given that ITV is the second most watched network in the UK. Quick reminder. The first episode airs today. Anything with more Wade Barrett on my TV is a good thing. I heard from friends that the camera work is bad but some of the matches were good. Ospreay vs. Bulldog Jr. was a fun sprint. Good little Ospreay showcase. Enjoyed the main event as well. Rampage as champ would make for good tv. Tag match was okay, with Hendry coming off well. The opener I thought was kind of bad - lame DQ, a botch and a non-finish. That's not the way to make a good first impression. Overall though, it was a decent show. I like a lot of the guys on the roster so I'll be tuning in next week as well. This whole thing didn't work for me at all. The pacing, production, and editing was far worse than anything WWE does and I thought they were the worst. I made it through the Ospreay match but that's as far as I got. It was just way too over produced and sanitized. Liked So Called Van on commentary. Tag team titles are very ugly. Keeping that autocorrect as it made me laugh, hopefully same goes for you. - editing was utterly abysmal, ruined any sense of temporal or spatial continuity whilst also stepping on reactions, facial expressions, etc. it was as if they were piecing together for a movie rather than a live sports event. Finally made it through episode 9. They finally pulled out a stupid overcomplicated stipulation match. It starts as a singles, but every time Breaking News Bennett pushes his buzzer two people join the match and it becomes a tag match, under elimination rules. But once all sixteen men have entered the match, and then after eight men have been eliminated, then it becomes an over the top rope every man for himself battle royal. Why they didn't just do a Rumble Royal I don't know. Episode 7 had a ladder match, where they'd cut out all of the ladder bumps out because they weren't PG. Which does make you wonder why they booked it in the first place. Episode 8 had a mask vs mask match, where you won by unmasking your opponent... and they guy who was unmasked kept his face hidden, then grabbed his hood back and put it back on. Defeats the object somewhat there. Overall, I'll probably watch the final episode. But I wouldn't be that surprised if the final episode turned out to be the FINAL episode. They have a great roster, but if your show is an hour long (minus commercial breaks), and nobody's a jobber, you want to do three matches tops. Preferably two. Certainly not four or more matches. Also, Alex Shane needs to choose his words better or get elocution lessons. If you want to describe a Brutal Battle, don't pronounce it Bwootoow Battuw. OK, they saved the best for last. Rampage vs Justin Sysum for the belt was really good. They managed to break one of the boards on a Superplex and kept going. Skip the whole series and just watch episode 10.